Ganesha is not only worship first but also he removes obstacles. He also provides intelligence. Ganesha mercy can remove every Vastu problems from the home. Lord Ganesha image removes Vastu dosh from main gate of home, worship place, kitchen and worship place. 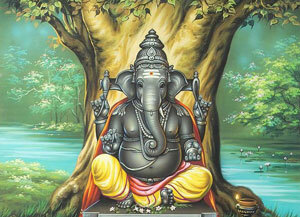 In astrology and Vastu, different color image of Ganesha is used. You can keep this image at different places in the home. Do not keep too many image of Ganesha in home. Do not keep three images of Ganesha at worship place. Keep Ganesha image, which is twelve fingers height. Its trunk should be left. It is extremely beneficial to keep yellow color image of Ganesha in home. Never offer basil leaf to lord Ganesha. Keep yellow or light green color image of Ganesha on study table or children’s room. Do not keep too many images of Ganesha in home. Keep only one image at one place. Do not keep Ganesha image in bed room. Keep Ganesha image inside the main entrance of home. Keep yellow color image at worship place. Offer Durva to Ganesha every morning. You can keep “Om” images in the home. It is beneficial to chant “Vakratunday Hum” psalm for 108 times in morning. It should be chant with Rudraksha garland. It increases harmony and peace in the home. Good Luck: It is beneficial to use light green color for good health and mind. Green color is also beneficial to cure wound.